This IDPS panel session was held on 13 June 2018 at the the GIZ sponsored FriEnt Peacebuilding Forum 2018. It brought together members of the IDPS with CIC/NYU Pathfinders multi-stakeholder partnership to implement the SDG16+, to provide their perspectives on the role of inclusive dialogue processes between donors, governments and civil society, in supporting peacebuilding and statebuilding and the Agenda 2030 in Sierra Leone. Sierra Leone’s government representative re-affirmed the continued relevance of the New Deal principles for Sierra Leone, although it requires some simplification. Sierra Leone is a founding member of the g7+ and is currently chair of the g7+ and co-Chair of the IDPS. Sierra Leone is also a New Deal pilot country and as such, has experience of New Deal implementation. For instance, in 2012 findings of the Fragility Assessment (FA) were used to inform planning of the national development plan (2013-18). In 2016, the updated FA was particularly useful in the elaboration of the Government’s response plan to the Ebola outbreak. The Service Level Agreement (SLA) of Ministry of Health, are testament to the incorporation of the New Deal (effectiveness) principles beyond Finance and Planning. Some challenges were also noted – even if many of the basic principles are understood, e.g. ‘mutual accountability’ – sometimes the overly technical language is a problem (FOCUS, TRUST, PSGs) for wider uptake. New opportunities for applying the New Deal emerged with the new government in place since March, as strong commitments were made to many of the issues that are close to the International Dialogue: inclusive governance, social justice, strengthening democracy, tackling corruption and fighting against violence against children and women, amongst other issues. Plans are underway for a new national development plan and the national budget – both of which are to be ready in November 2018. Supporting coherence and coordination between actors and initiatives in order to avoid duplicating efforts and overwhelming the government is key. DEPAC (Sierra Leone’s mechanism for dialogue between donors, civil society and government) which meets on a quarterly basis, needs to be re-energized. We should be careful not to get bogged down in processes that focus on targets, indicators and mechanisms and lose sight of what brings us together. The SDGs are just a vehicle to address broader questions such as eradicating all forms of violence, building democratic institutions etc. The country dialogue process should focus on helping the government to deliver on its priorities and commitments, including delivering the SDGs and playing a leadership role as a Pathfinder for Goal 16+. The New Deal principles could help, but it is important to ensure that the form follows function and not the other way round. Yet, processes are important. How we get to where we want to, in a way that builds cohesion and inclusion is not always straightforward. Participants identified several potential challenges including the profusion of initiatives around building peaceful, just and inclusive societies and competition between these initiatives. Some interest was expressed in mapping and an assessment of all these initiatives with a view to aligning them before presenting an offer to the government. Whilst scoping is important, others insisted on prioritising concrete actions and results, rather than overwhelming the new government. The country dialogue process could provide a forum for fostering coherence between these initiatives, identifying synergies and creating partnerships within the country based on comparative advantage; improving and strengthening coordination between donors; and strengthening the existing institutions. The FA in particular was identified as a useful country-led assessment that could be used to convene all those wishing to invest in joint risk assessments. It was suggested strongly that the IDPS convenes a country dialogue around sharing and further developing this assessment. The language around ‘fragility’ is sensitive in New York and inside Sierra Leone, and as such may need to be reviewed. Building peaceful just and inclusive societies, which are resilient, could work better as a message. The lack of national cohesion became most apparent during and after the elections. Yet, someone suggested that Sierra Leone’s political tensions are deeply rooted in its history and state formation itself. Some highlighted the potential contradiction between ending impunity and the need for building cohesion. Civil society participants insisted on the importance of accountability without a political witch-hunt. Social cohesion with accountability, security and land rights (particularly in context of mining and extractives) were suggested as possible focus of future country dialogues. Civil society representatives raised concerns about increasingly restrictive NGO policy – in light of government concerns to have more visibility over service delivery, requiring NGOs to register to ensure equitable regional distribution. The article highlights the g7+ perspective on how to sustain peace through the New Deal. The New Deal has been a central point in the nexus of peace, effective states institutions and development in fragile and conflict affecting settings states - "a phenomenon that has recently found a central space in international discourse on peace, security, and development" by the World Bank and United Nations joint force to achieve Sustainable Development Goals by 2030. Investing in sustainable Infrastructures and strengthening national institutions. "In 2015, the adoption of the 2030 Agenda reaffirmed the key importance of peace as one of the key pillars the agenda is built on. The inclusion of a ‘peace’ goal and related peacebuilding and statebuilding goals in the 2030 Agenda was a landmark achievement following earlier concerted advocacy by the collaborative partnership of the International Dialogue on Peacebuilding and Statebuilding (IDPS). The 2030 Agenda acknowledges that each country faces specific challenges in its sustainable development, but advocates that the most fragile countries and countries in situations of conflict and post-conflict deserve special attention. This distinction calls for deeper reflections on the way we engage in fragile and conflict-affected states and how to build on existing frameworks, such as the New Deal for Engagement in Fragile States to make the implementation of Sustainable Development Goals a success. This policy dialogue explores the existing opportunities offered by the IDPS partnership, as well as the role the IDPS partnership can potentially play in the landscape of global development frameworks vis-à-vis the 2030 Agenda, and the Sustaining Peace and Conflict Prevention Agendas. First, we briefly look back to where the IDPS partnership comes from with reference to the New Deal for Engagement in Fragile States. We further examine how the New Deal framework can bolster sustainable peace in fragile and conflict-affected settings. Finally, we point to a key element, inclusion, that is central to preventing conflict and sustaining peace in fragile and conflict-affected states [...]"
On 3 July, Mireille M. Kabasubabo and Peter Van Sluijs from the CSPPS Secretariat published an article entitled 'Dialogue Partnership for Prevention: The International Dialogue in Context of the 2030 Agenda, Sustaining Peace and Conflict Prevention Agendas'. 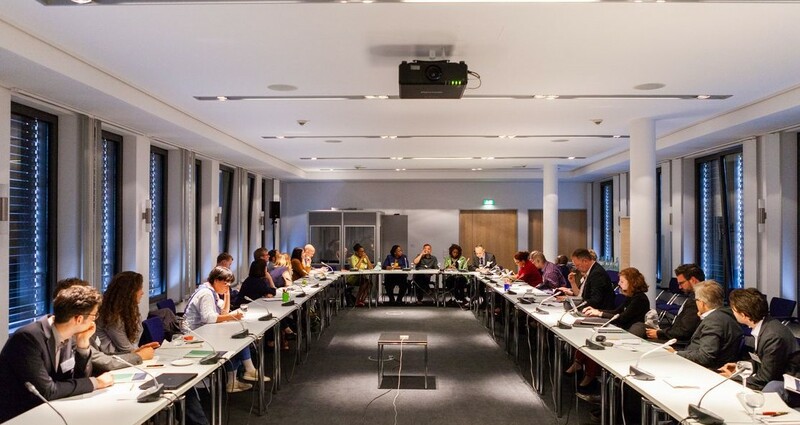 The Civil Society Platform for Peacebuilding and Statebuilding (CSPPS) held its annual Core Group meeting, gathering its Southern and Northern membership, from 12 to 13 April 2018 in The Hague, The Netherlands. During this meeting, CSPPS members reiterated their support to the New Deal principles, the IDPS partnership and its country level work, notably the country dialogues, for the realization of Agenda 2030, and Conflict prevention and Sustaining peace agenda in contexts affected by conflict and fragility. Read the Hague Declaration in [ENG] and in [FR].